Seth Godin’s book All Marketers Are Liars is a must-read for all entrepreneurs, marketing professionals, and business leaders. The book explores the concept of storytelling and why it’s so important for marketers to tell authentic stories that resonate with consumers. Businesses, both large and small, are sometimes so engrossed in describing the various features and benefits of their products or services that they fail to tell a convincing story to their consumers. As a result, their offerings get little attention or are totally ignored. In the book, Godin suggests that if businesses truly believe in their products or services, they should take the time to tell a story that resonates with consumers. In the book, Godin tries to differentiate the lies that marketers tell — one lie is told to make a product or service better. It is authentic and fits the consumer’s worldview. The other lie is a deceitful one, told by marketers for selfish gain. It’s only by focusing on the former — lies that fit consumers’ worldview and makes the product/service better can marketers truly thrive. I’d be doing injustice to Seth Godin’s book if I were to sum it up in 7 lessons. So these are just the highlights. I’d urge you to read All Marketers Are Liars to get a deeper understanding of Godin’s marketing philosophy. 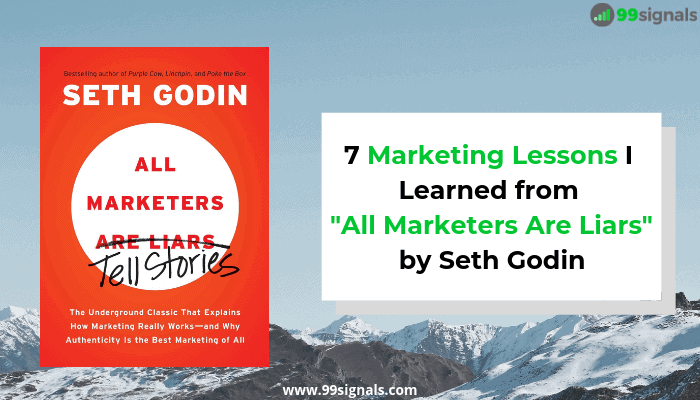 In the meantime, here are the 7 most important marketing lessons I learned from Seth Godin’s All Marketers Are Liars. All successful marketers tell stories. When they are marketing a product or service, they don’t focus on its facts, features, or benefits. They focus on stories. This is because only stories have the potential to spread from person to person. To elaborate this point, Godin provides the example of Riedel Wine Glasses. Riedel tells a story of how any wine, whether it is a $200 bottle of wine or cheap wine, tastes better when served in proper Riedel glasses. While there’s absolutely no scientific reason why it should taste better, it does because people believe it should. Millions of wine drinkers around the world, experts and amateurs alike, believe the story told by Riedel and have no trouble discerning just how much the wine tastes better in Riedel wine glasses. The story told by Riedel is not true because it’s factual, but true because it’s consistent and authentic. It’s just marketing that’s making the wine taste better, not the glasses. There was a time when marketers could profit by satisfying needs. And they used to do this by selling people a commodity. Making a product or service cheaper or better was top priority and a sure-shot path to profitability. Times have changed. Plenty of businesses can make something marginally better than you can and offer it at a cheaper price. Satisfying needs is no longer a sustainable strategy for marketers. As a result, marketers should focus on satisfying wants, not needs. Needs are practical and objective, whereas wants are irrational and subjective. It doesn’t matter what you sell as long as you are satisfying wants, and not needs. Godin believes that the best marketers are artists, not scientists. They realize that whatever is being sold (a product, a service, a religion, or a political candidate) is being purchased because it creates an emotional want, not because it fills a simple need. A great story is true. Great stories make a promise. Great stories agree with our worldview. Godin believes all great stories agree with what the audience already believes. The stories make them feel smart and secure when reminded how right they were in the first place. Godin provides an example of how special a consumer feels when she buys a new pair of Puma sneakers for $125. It’s not the product that makes her feel special, but the story told by Puma — a story about hipness, belonging, and fashion. Worldview refers to the rules, values, beliefs, and biases that an individual holds. Marketers should never try to change their consumers’ worldview. Instead, they should try to frame their story in a way that leverages a consumer’s existing worldview. 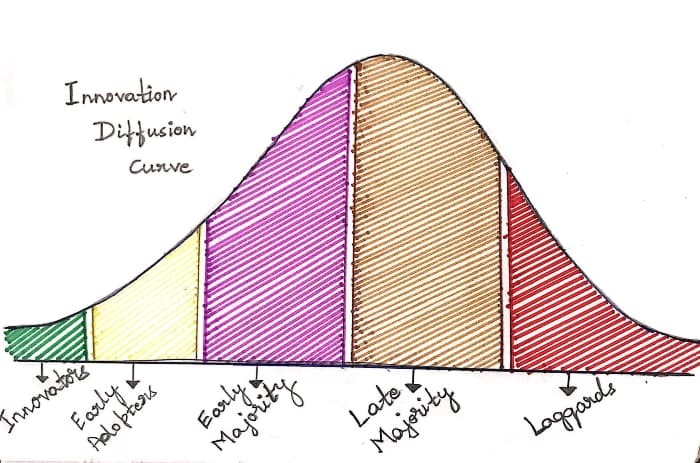 Marketers usually focus at the center of every curve they encounter which is always crowded and devoid of unfilled wants. As a result, they are always disappointed. Successful marketers always focus on the edges as this is where you’ll find people with an unfulfilled worldview. Godin suggests that marketers should work towards identifying a population with a certain worldview, and frame their stories in terms of that worldview. First impressions play a vital role in all the important buying decisions consumers make. Snap judgements are usually made to avoid the onslaught of choices and once the decision is made, consumers will bend over backward to defend these choices later. The concept of snap judgments is also at the heart of Malcolm Gladwell’s groundbreaking book, Blink: The Power of Thinking Without Thinking. The problem for marketers is that we have no idea at all when the first impression is made. This is why marketers must always be authentic in their storytelling. Godin believes the reason why authenticity matters is because the timing of consumers’ first impressions is too hard to predict. Therefore, if marketers are authentic and consistent in their storytelling, they will cover all the possible impressions, and allow the consumer to convert them into a convincing story. A fib is a story that makes something better. It’s an honest lie — it’s authentic, like the Riedel Wine Glasses. Another example would be the claim by Mercedes that they are fifteen times better than Toyota. Is this claim true? Hard to tell. But Mercedes buyers tend to believe the story. It’s a story of solidity, workmanship, safety, and performance. Mercedes is telling an authentic lie by telling a story about a car that’s worth talking about. A fraud, on the other hand, is a story primarily told for personal gain. It’s a deceitful lie told by the marketer for his selfish benefit. The most recent example I can think of is the Fyre Festival. Watch the Netflix documentary Fyre: The Greatest Party That Never Happened and Hulu’s Fyre Fraud to learn more about this gigantic fiasco. Godin suggests that we make use of fibs in our marketing. Fibs allow marketers to take responsibility for the stories they’re telling. It enables them to be authentic and live the lie fully and completely. The cost of deception is high. Storytelling has to be authentic. If your story is inauthentic, you’ll get the benefit of just one sale as opposed to a hundred when your story is authentic. It works incredibly well for marketers in the long run. Because authentic stories have the power to spread from person to person. Godin suggests that we craft a story that we enjoy telling ourselves. Before we tell the stories to our consumers, we need to tell the story to ourselves and be convinced of its authenticity. Seth Godin is a marketing guru who has earned the title through his rigorous work in the field of marketing. He believes All Marketers Are Liars is one of the most important books he’s ever written. And once you’re done reading the book, you’re able to fully appreciate Godin’s passion for storytelling and why it’s so important for marketers to enhance their offerings by telling compelling stories to consumers. As the cover of the book claims, authenticity is indeed the best marketing of all, and authentic marketers succeed and thrive. First Impressions are a lot more powerful when you start with a story about a struggle you had and then slowly move into the part of how you overcame the struggle. That will slowly move the audience to subconsciously agree with you and move them onto your point of view. Emotion is key to selling or trying to get people onside.